A recent global CISOsurvey shows that most organizations feel they are more at risk today than 12months ago. No surprise: not only are cyber attackers becoming moresophisticated, but also, organizations are increasingly hyper-connected withwave upon wave of new technology creating opportunities and risks across thevalue chain. In order to better protect and prepare for the future enterprise,today’s CISOs must be armed with the latest technologies, techniques,intelligence, talent and most importantly a leadership vision for predictingand mitigating potential cyber risks. 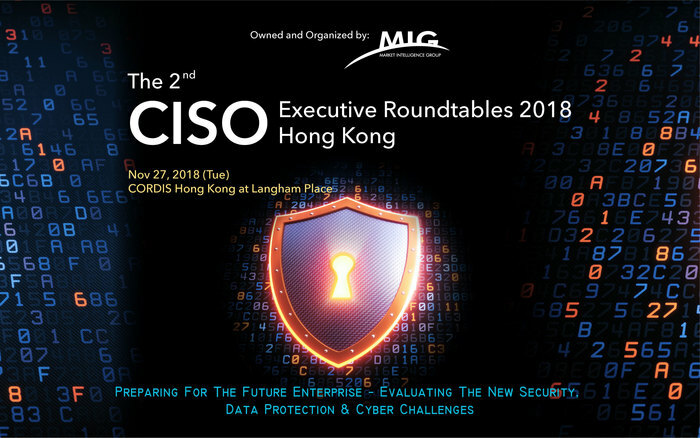 Carrying the theme of “Preparing For The Future Enterprise - EvaluatingThe New Security, Data Protection & Cyber Challenges", this year,The 2nd CISO Roundtable 2018 will again serve as an important platform forCISOs and IT security leaders to gain access to the latest threat landscapes,cyber risk intelligence and cybersecurity capabilities, to meet with theirpeers to discuss their proactive strategies to risk management and securityoperations, and discover new and innovative solutions. The roundtable featuresVisionary Keynote Presentations, Thought Leadership sessions and ExpertsSharing on the future cybersecurity imperatives and will also include anin-depth look at how geopolitical situation in cybersecurity is changing, andits potential impact on commercial organizations. Should you have any enquiries, please do not hestitate to contact Mr. Donnie Chan at donnie.chan@mig-events.com or contact us at keith@hkfec.org.